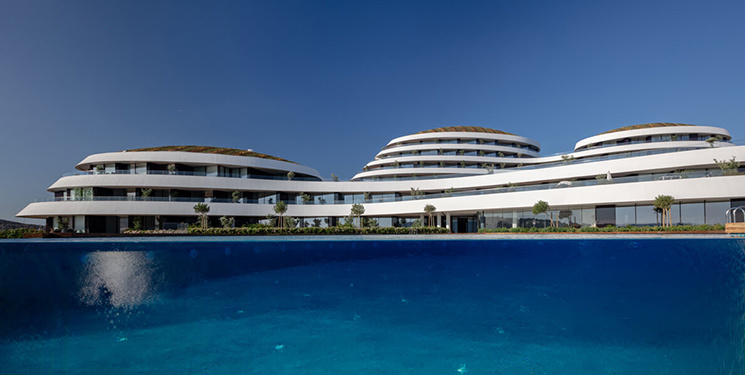 In the Turkish holiday resort of Çeşme to the west of Izmir on the Aegean Sea, Dilekçi Architects have realised a hotel and residential facility project with a powerfully symbolic character. In addition to the choice location and unique design, the complex is distinguished by its unrestricted sea views. For the prestigious project on the Çeşme peninsula, the investor group put a premium on innovative fundamentals. Comprising 40 rooms, 18 suites and 12 specially designed units, the residential complex also accommodates sports and wellness facilities as well as communal spaces. The exclusive location called for a concept that would unlock its potential. The sloping site of the project, which descends perpendicularly to the sea in the east, and also its close proximity to the harbour presented creative challenges for the designers. A building design in which all the units would face the sea ultimately called for some highly exceptional solutions. The key inspirational factor was the natural topography of the surroundings and its hilly landscape. Sited on different levels, the geometry of the three separate hill-like volumes breaks up the high mass density of the sizeable plot. The north-facing positioning is diffused by the elliptical geometry. Inspired by the stylistic language, the project was aptly named ‘Folkart Hills’. The design exploits the cooling effect of the northerly winds, while the shaded areas created by the broad terraces also serve as passive climatic measures.